Along with Mojave Trails and Castle Mountains, Sand to Snow is one of three recently-created national monuments in southern California, established by President Obama in February 2016. The preserve is so named because of the wide range of elevations and habitats contained within, from sandy plains and arid hills split by winding ravines, on the fringes of the Mojave and Colorado deserts, to high peaks covered by snow more than half the year; it extends west from the Little San Bernardino Mountains along the border of Joshua Tree National Park, where elevations are as low as 1,500 feet, to the eastern summits of the much higher San Bernardino range, the tallest peak being 11,503 foot San Gorgonio Mountain. The protected area is mostly continuous (see map), the only exceptions being the developed region around Morongo Valley and a narrow corridor either side of Hwy 62, and there is also a small, detached section a little way north, near Flamingo Heights, containing the two low peaks of Black Lava Butte and Flat Top. Some land within the national monument was already protected including Big Morongo Canyon, one of the ravines through the Little San Bernardino Mountains, which was designated a wildlife reserve in 1982, and is now the most popular and easiest-accessed location in the lower elevation, eastern section of the monument, less than a mile from Hwy 62. There are several other trailheads along this road, and at the end of other roads off Interstate 10 to the south, while the high elevation, western section of the monument can be explored via a network of paths starting along Hwy 38. The middle part is much less accessible, though it is crossed by 30 miles of the long-distance Pacific Crest Trail. Beside the wide range of landscapes and the many accompanying recreational opportunities, Sand to Snow is also notable for its different habitats and wildlife zones, supposedly the most diverse of any US national monument. 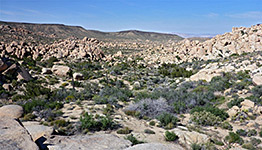 The most visited area is to the west - the peaks and valleys of the San Bernardino Mountains, most of which are within the San Gorgonio Wilderness, though the desert regions to the east are perhaps more interesting, and varied, including oases, Joshua tree forests, volcanic mesas, streams and rock art panels. Entry to the western section of Sand to Snow National Monument is from at least ten trailheads along Hwy 38 and the linked Mill Creek Road, from where paths follow ridges and valleys, climbing to various peaks including San Gorgonio Mountain, California's highest summit south of the Sierra Nevada. The mountains are popular all year, for snow-based recreation in the winter, and regular hiking and camping in the summer, when the cool forests provide a respite from the heat below. Several dozen primitive campsites are spread out along the trails, facilitating multi-day trips. There are far fewer paths east of San Gorgonio Mountain, where the terrain is significantly steeper, and the land falls away in a series of deep valleys and narrow, sloping ridges. The southern edge of this large region has three main access points, at the end of Cottonwood Road near I-10 exit 110 (a connection with the Pacific Crest Trail), at the end of Whitewater Canyon Road, from I-10 exit 114, and along Mission Creek Road off Hwy 62, which leads to the edge of Mission Creek Preserve, a riparian area spanning the boundary of the Sonoran and Mojave deserts. The latter two roads also lead to paths that link with the Pacific Crest Trail. Other vehicle tracks reach the northern extremities of the national monument, starting from Pioneertown and Morongo Valley, including along the upper reaches of Big and Little Morongo canyons, but they do not see much use. The lower sections of these canyons, east of Highway 62, are more readily accessed, however, especially the larger drainage, which has a developed trailhead. From here a 4.3 mile path leads south, all through the western end of the Little San Bernardino Mountains to another access point, at the edge of Coachella Valley. The lower reaches of the longer Little Morongo Canyon is followed most of the way by a 4WD track, which continues to the town of Yucca Valley, coming close to the northwest corner of Joshua Tree National Park. The detached section of the national monument, centered on Black Lava Butte and adjoining the Bighorn Mountain Wilderness, contains outcrops of granite boulders with Joshua trees and many other desert plants, and is easiest reached via a lightly-used trail off Pipes Canyon Road, on the west side of Hwy 247.